Venice is famous for many things: the Rialto, the Grand Canal, the over-the-top costumes of Carnival. But Venice is infamous for some things to, particularly for expensive and bad food that barely resembles Italian food. We won’t kid you and say that we haven’t experienced a stop-your-heart bill for what you’re certain was a frozen lasagna heated up ourselves. But the beauty of living in a small village a short train ride away from Venice for seven years is that we got to know the city and where to eat really well. You might not have seven years – or even seven days – to test out the thousands of restaurants in Venice. But you can eat some of the best Venetian restaurants the city has to offer on a Venice food tour. Put down the slice of pizza and step away from the tourist menus along the Grand Canal. Does a tourist menu including a bellini, first and second course for just €11 sound too good to be true in an expensive city like Venice? That’s because it is. We’re here to tell you that is not Venetian food. The saucy pasta dishes and thin crust Neapolitan-style pizza so many of us are familiar with are Italian-American incarnations of dishes from the many southern Italian immigrants that made their way to America. In reality, the food in Italy varies from region to region. The Veneto, where Venice is located, is the region that stretches from the Atlantic to the Alps and has some of the most varied cuisine found in all of Italy. 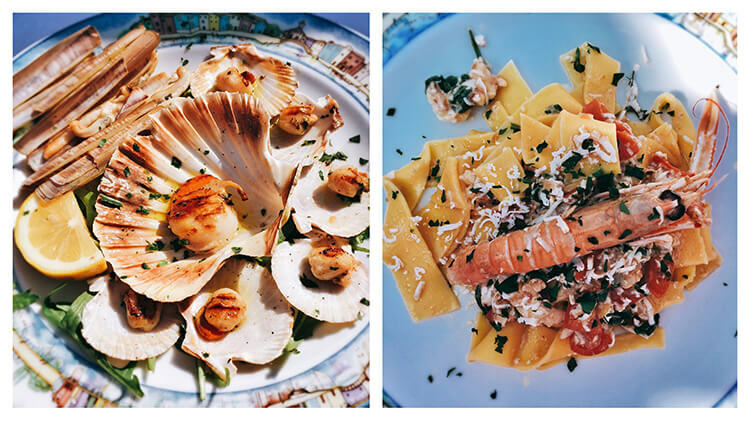 With Venice being an island, it’s no surprise that fresh fish and seafood has long played a star role in Venetian cuisine. Venice was also a major player in the trade routes, and trade partners from the Middle East and Asia influenced the cuisine with the addition of rice and spices. We also can’t forget Venice’s proximity to Eastern Europe. The heavy use of meat, polenta and potatoes in those cultures began to influence Venetian food and things like liver and onions became Venetian staples. Even France played their part by introducing sugar, which transformed Venetian pastry making. If you want to try real Venetian food, it’s dishes like sarde in soar (sardines in a tangy sweet and sour sauce), baccala, squid ink pasta and fegato alla Venezia (Venetian liver and onions) that you should seek out. 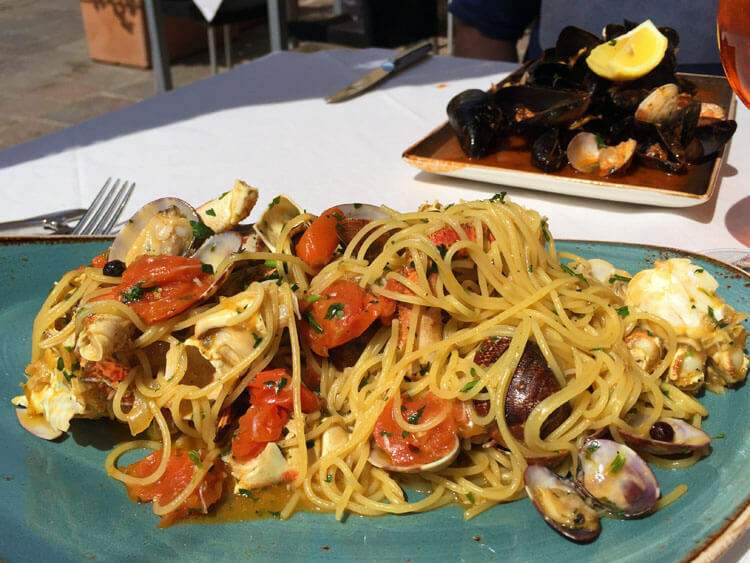 If sardines (I don’t like them either) or squid ink (very salty, but very tasty) sound just a little too fishy for you, try spaghetti alle vongole (spaghetti with clams). It’s a typical dish from the Veneto and one of our favorite pasta dishes in the region. Or try bigoli with ragu. Bigoli is the name of the thick spaghetti-like noodle typical to the Veneto. You’ll find it with different kinds of ragu, and a duck ragu is typical, rich and delicious. You also can’t go wrong with a plate of fresh fish or seafood. Razor clams are typical in Venice. You’ll also find fried soft shell crabs seasonally. And fritti misti, or mixed fried fish, is perfect with some lemon squeezed over it. Eating in Venice can be a seriously daunting task. There’s thousands of restaurants, most of which don’t even have a website. And many of the best restaurants in Venice won’t have a posted menu at all, let alone one in English. Chalkboard menus or a handwritten menu that the waiter or waitress reads off to you are found in many of our favorite sit-down Venetian restaurants. That’s because the best local restaurants in Venice will use only fresh, seasonal ingredients. Chefs go out to the market and decide the day’s menu based on what they can purchase. And our absolute favorite thing to eat in Venice is cicchetti (pronounced chi-KET-tee). Venetian cicchetti are small snacks or side dishes sort of like Venetian tapas served in bars around the city at lunchtime and before dinner. Cicchetti are properly enjoyed between 5 and 8pm, when locals go on a giro d’ombra – an age old Venetian tradition that is a social pub crawl where you snack, drink and chat with friends along the way. Just like Spanish tapas, there’s usually no posted cicchetti menu and you select your cicchetti from what’s on display. Each one costs typically just €1-2.50 a piece, making cicchetti bars the best cheap restaurants in Venice that you’ll find. Venetians then enjoy cicchetti standing around the bar, or just outside of it. Cicchetti are as close as it gets to Venice street food, though you wouldn’t take cicchetti away and eat it on the go while actually walking around the city. Why Go on a Venice Food Tour? We personally love going on food tours. It’s our favorite way of discovering a city since you get to eat delicious things, learn about some of the best places to eat and get a bit of history mixed in. We always recommend booking a food tour as early on in your trip as possible, because you’ll discover some places you want to go back to. And you always get additional recommendations from the guide. A food tour is definitely among the best Venice tours you can book. 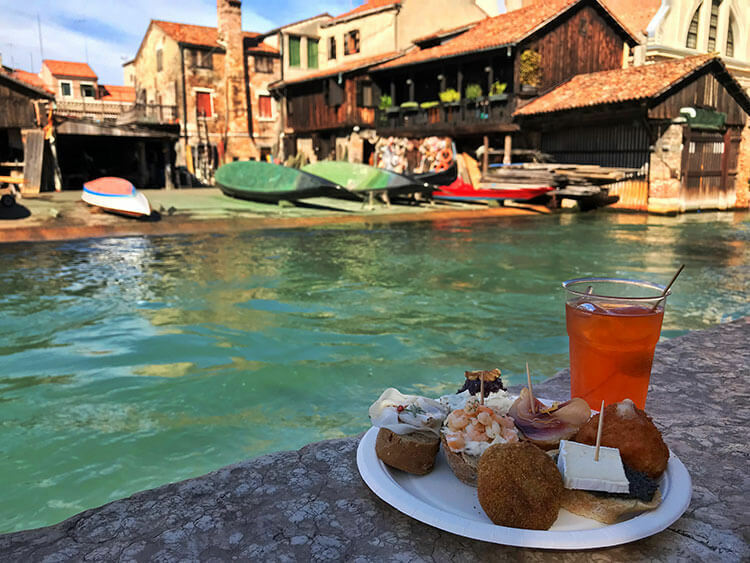 We’ve been on multiple cicchetti tours of Venice, and these are always great because the bacari (cicchetti bars) are the best cheap places to eat in Venice. At just €1-2.50, you can easily make a filling meal for around €10-15 per person. And a cicchetti bar is perfect for a quick lunch when you’re trying to pack a lot of sightseeing in. Cicchetti can be entirely unique to each bacaro. There’s no encyclopedia of cicchetti so that you can prepare yourself in advance. You simply line up, point and pay. Cicchetti can be purchased individually, or sometimes the bar will offer a cichetada – a platter of the house specialties. 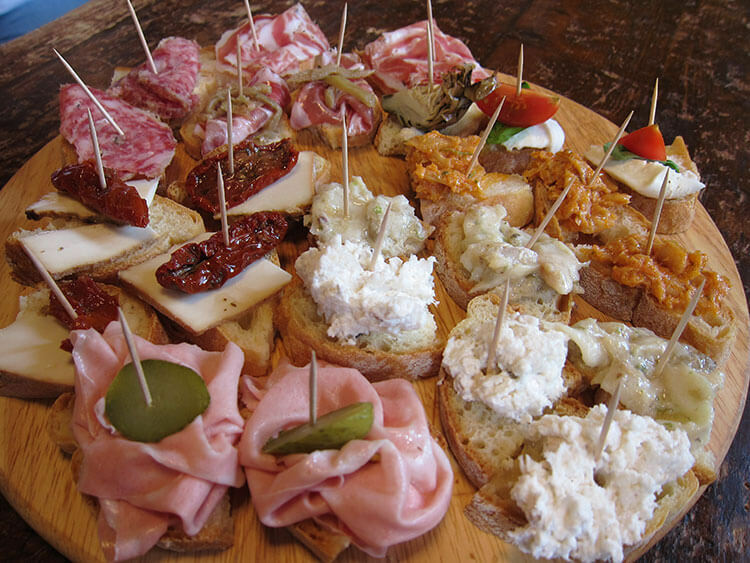 The most typical kind of cicchetti are crostini. That can be anything from baccala (salt cod) to a piece of cheese on top of a little piece of bread. Polpette, or fried meatballs, are also fairly common to most bacari. There’s no shortage of bacari and seeking out the best cicchetti bars in Venice can be intimidating. The guide on a Venice cicchetti tour will show you how to order and help explain the different kinds of cicchetti available. You also learn interesting things about Venice, like there are six historic sestieti (districts) that make up the city. There’s a lot of cicchetti bars in Cannareggio, the northernmost of the districts, and both of our favorite cicchetti tours visit this part of Venice. 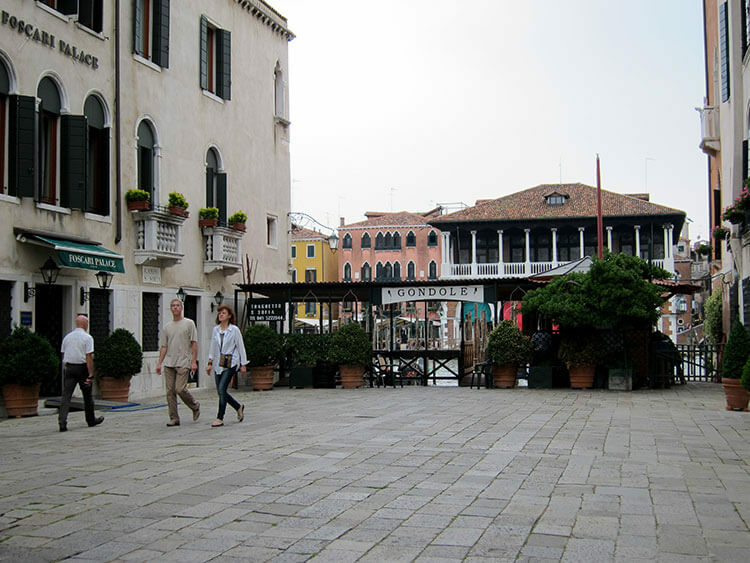 Known as the Jewish Ghetto because Cannareggio was the area that Jews were once restricted to living in. It was enclosed by guarded gates and no one was allowed to leave from sunset until dawn. These restrictions continued for more than 270 years until Napolean Bonaparte conquered Venice and tore the gate down. 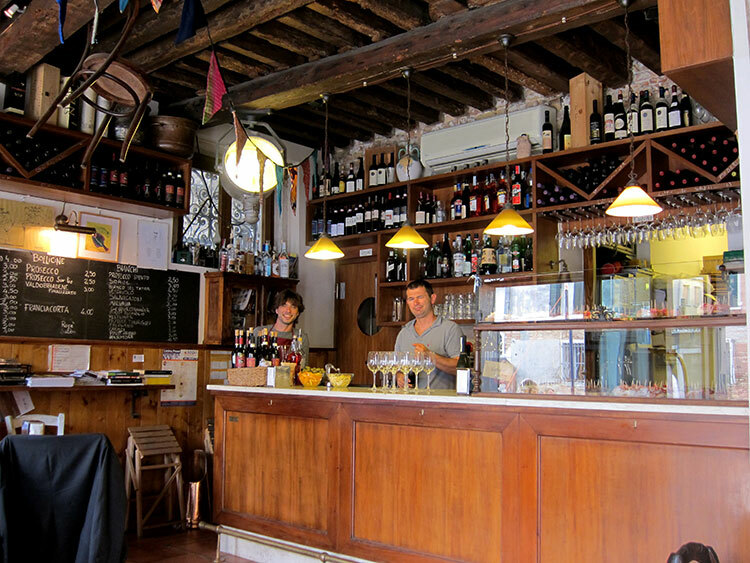 One of our favorite cicchetti bars is a tiny little bar with just a few tables and a boat moored in the canal where you can also sit in Cannareggio. It’s Al Timon and they are quite famous for their meat selection and their Prosecco. It is also one of the few places in Venice which you will pay the same price regardless of whether you sit or stand. Cicchetti of the day are displayed in the glass case at the bar and you can select many at just €1 a piece. In the Rialto area, some of our favorite bacari are literally steps away from the main tourist haunts but are often passed over by the streams of tourists. After taking a Venice food tour, you’ll have the confidence to investigate the offerings are places like the little un-named shop right alongside the famous Pescheria Rialto fish market. Here owner/chef/server Bruno purchases all his fish from the daily fish market and cooks it up into delicious cicchetti. Once he sells out of whatever he’s made for the day, he closes up shop and goes home. His tuna carpaccio on a brioche with mustard and his skewered anchovies with sweet red and yellow peppers are to die for. Enjoy it with a glass of Garganega. 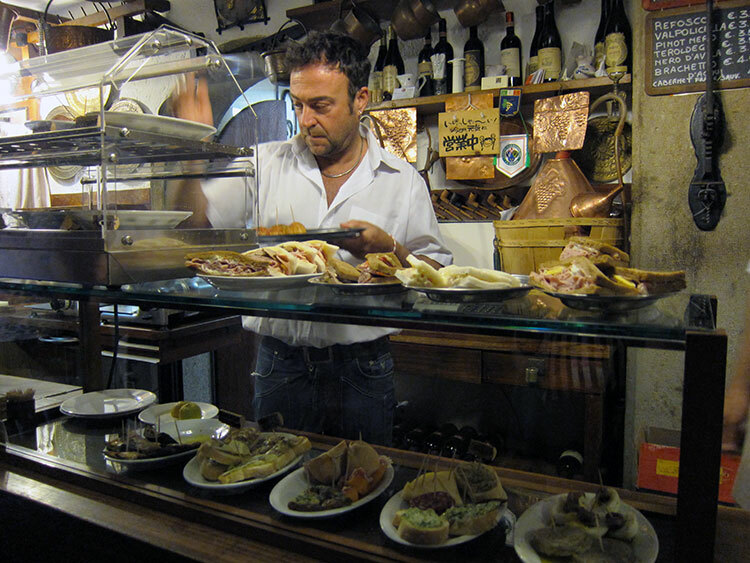 Many locals will agree that the best cicchetti in Venice is found at All’ Arco just steps away from the Rialto Bridge. There’s almost always a line, unless you happen to catch them in the odd lull. Here you’ll find crostini topped with things like an Italian of blue cheese and sweet onion marmalade or a salty-sweet San Daniele proscuttio with melon. Try an Aperol Spritz, an iconic Italian apertif that was invented in the region. Or try the white wine from the Veneto called Verduzzo. The Verduzzo served at All’ Arco is only produced exclusively for the osteria. 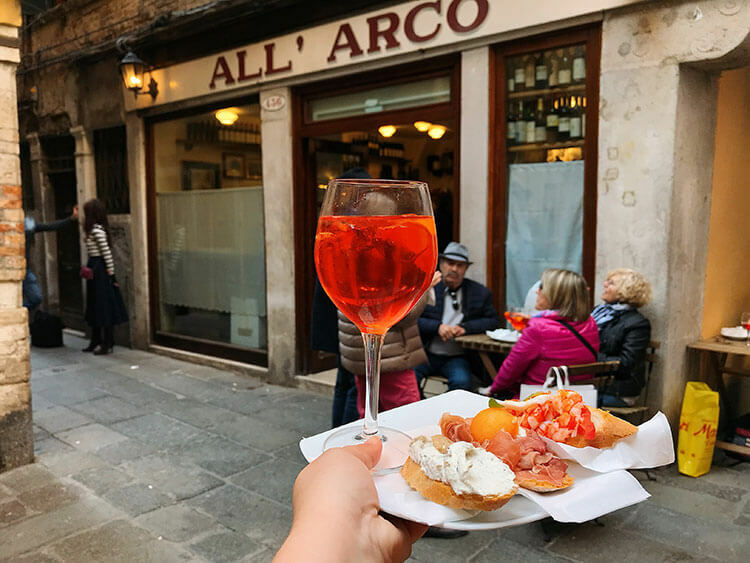 What you’ll be most surprised about during your cicchetti tour is that nearly all of these Venetian bars are just a street and steps away from the normal hustle and bustle of the most frequented tourist areas. You may have even passed by and like so many others, don’t even realize that these tiny bars are hiding some of the best food in Venice. Aside from learning about the best cheap restaurants in Venice, you’ll learn how to drink on the cheap too. What Venetians are walking around with that looks like wine in liter plastic bottles is exactly that. Called vino sfuso, or wine on tap, it’s a young wine that is sold in shops. You bring your own container and pay just as little as a couple of euros per liter. And both of our favorite Venice cicchetti food tours also include a gondola ride. It’s actually on the traghetto gondola, which locals still use to this very day as a means to ferry quickly across the Grand Canal. Locals pay just €0.70 for the traghetto and tourists pay €2, which is still quite a bargain in comparison to a vaporetto (water bus) ticket or hiring a gondola for a ride. Some of the same families have run the traghetti services for centuries. There’s seven crossing points where the ferries take you back and forth across the Grand Canal located between the train station and San Marco. The traghetti gondolas are not decorative like the gondola for touristic rides, but the premise of the boat is the same. A gondolier rows and the passengers stand as it takes just a couple minutes to cross the Grand Canal. Even at the €2 non-local price, a traghetto ride is the cheapest gondola ride you’ll find in Venice. Urban Adventures offers a wine and cicchetti tour Venice at either 11:30am or 5:15pm Monday – Saturday. The tour lasts 2.5 hours. Walks of Italy Venice Food Tour is available on Tuesdays and Saturdays at 10:30am. The tour lasts 2 hours and 45 minutes. This article contains affiliate links. When you book on Walks of Italy or Urban Adventures through our affiliate sites, we earn a small commission at no additional cost to you. This sounds great. I wish I had known about these tours when I visited Venice. Well, dad, we’ll be in Italy for another four year. I guess you’ll just have to come back for another visit! I miss Italy!!! You two gave a great tour while I visited!!! Thanks, Rob! You should come back to visit now that we’ve been here for more than just a few weeks. We can really give you a good tour now! This looks like a great little tour. I’ve visited Venice numerous time but never seem to find the hidden local places, they always seem to have the best food and drinks too. I already looked to see if there is an Urban Adventure tour on my upcoming trip to Greece. Venice is such a great city! This sounds like a really fun tour. I do enjoy seeing the touristy sites, but I love getting to see the locals side of cities as well. This was a super fun tour, Ali! I will definitely be enjoying more cicchetti. I can’t believe it took me three years of living less than an hour from Venice to try cicchetti! Your Urban Adventures tour sounds amazing, I love discovering the quieter places, especially in touristy places. I can’t believe the .50 cent gondola ride – WOW. I’ve heard they usually cost a couple of hundred! It was a GREAT tour! And the .50 cent gondola ride was far better than the one that I paid a lot of money for last year. Sadly, I felt like I was on a Disney ride with all the other gondolas in a row right behind us. I’m so happy I had another opportunity for a gondola ride that made me feel like a local, rather than being in a production line. I can’t wait to do this tour on my next trip to Venice! It’s a really great way to discover local places. Let us know the next time you come to Venice! We’ll have to meet up. I’ve got to admit I’m not that crazy about Venice. I think I was just expecting too much but instead I came away feeling a bit disappointed. It’s an amazing place to walk around but,, as controversial as this may sound, I’d take the rough and ready charm of Naples over Venice any day. Now that’s a city with a bit of character! I have to agree that Venice is not my favorite Italian city, Si. But there are some off-the-beaten-path things to do there that we’ve really enjoyed. The cicchetti bars are great for cheap eats and our favorite thing we’ve ever done was to learn how to row a gondola. Carnivale is always a good time too. Thanks for following us on Twitter and for introducing me to your website – very nice! We also like wine. If you have a chance pls check out our brand new website, any comments or facebook likes appreciated!